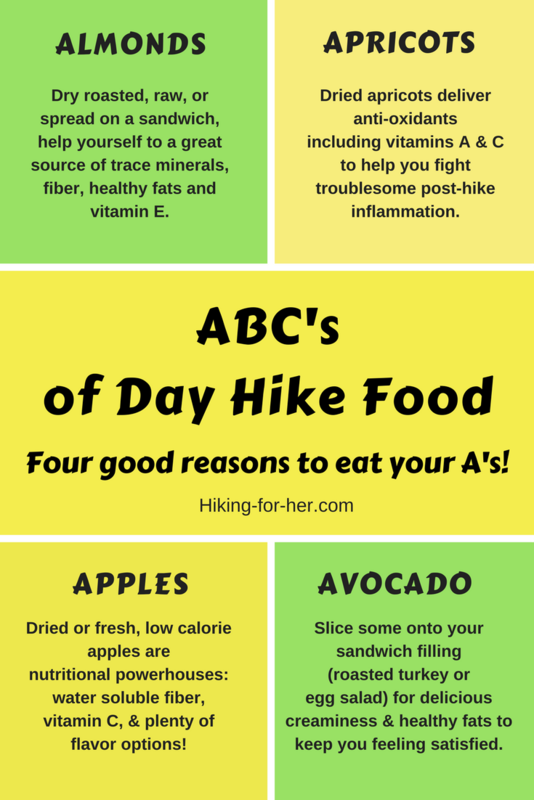 Day Hike Nutrition Tips: Easy As A-B-C! 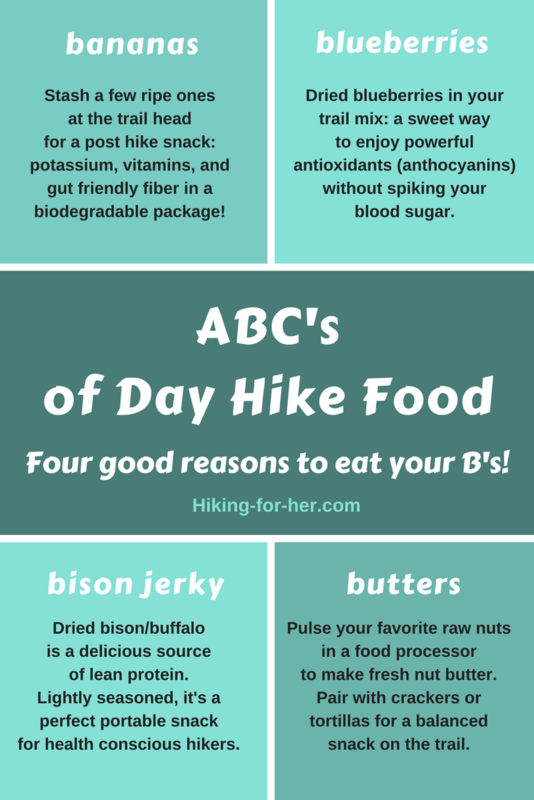 Day hike nutrition tips are important for feeling your best, no matter what the trail throws at you. 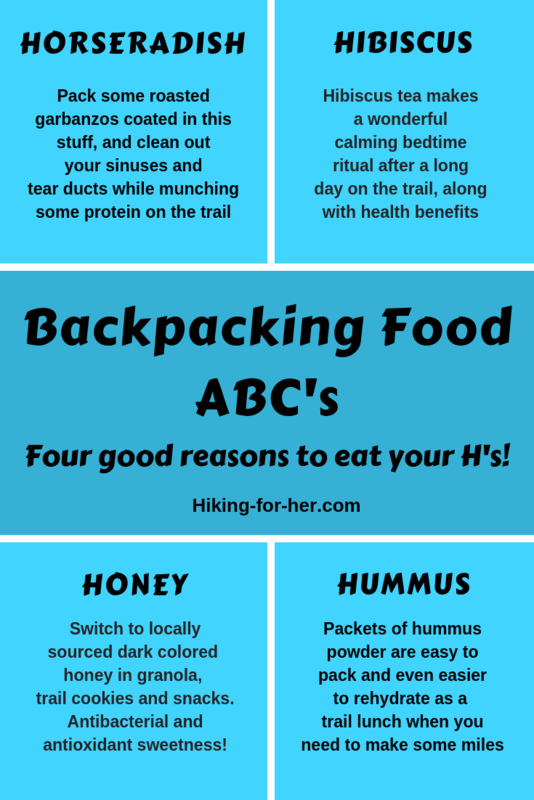 Hiking For Her knows a thing or two about biochemistry, nutrition and what travels well in a backpack. But long scientific explanations are boring. And all of those long names of biomolecules? 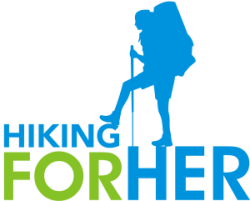 Hikers like you want practical, easy to remember nutrition tips. So here they are, in alphabetical order. 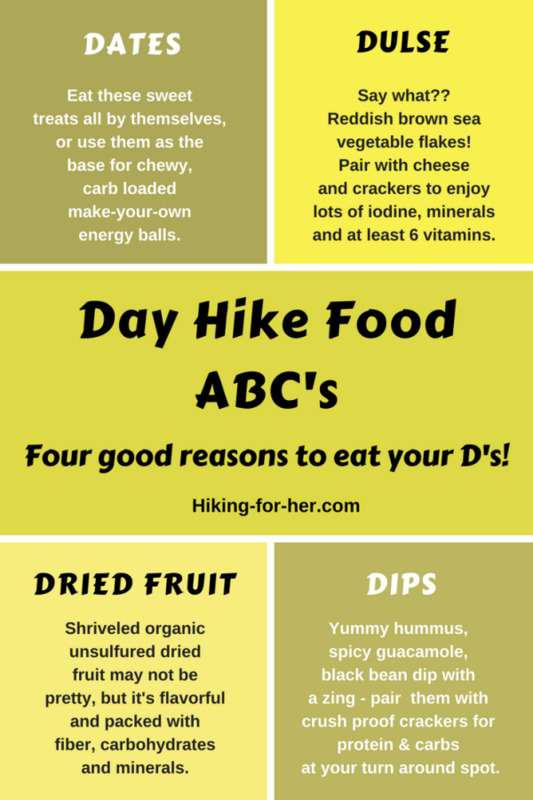 In your day hike lunch sack, be sure to include crunchy, savory, satisfying foods like these! Almonds, apricots, apples and avocados will keep you going, mile after mile. And your taste buds will thank you, too. Notice what we're doing here? 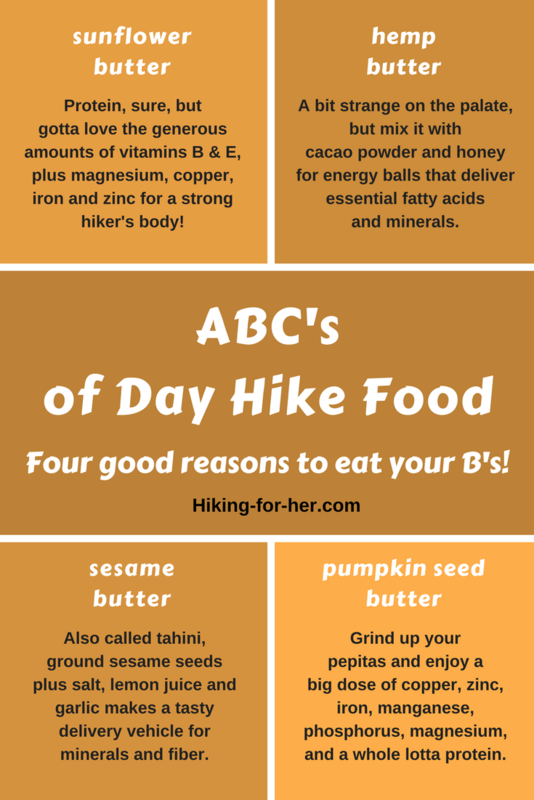 The alphabet is a great way to organize these day hike nutrition tips, and make no mistake, these B's are the best! Don't overlook unusual and enticing nut butters in your day hike repertoire! Nuts are powerhouses of trace minerals like copper and zinc, and provide lots of nutrition for hard working muscles. So mix it up a little, and leave the reliable but slightly boring peanut butter on the shelf at home. Nothing satisfies more than healthy fats, and the right kinds of delicious chocolate, cashews and coconut will keep you satisfied as well as fueled up for your hike. 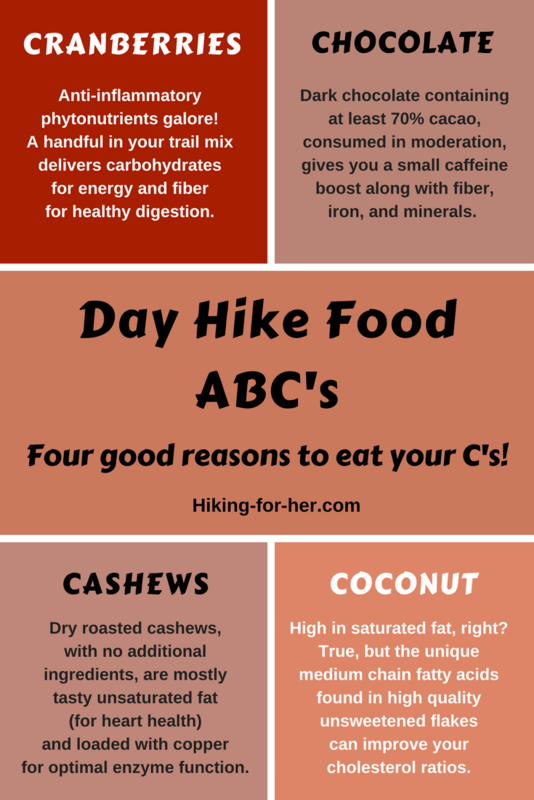 And if you're clever (I have full confidence in you), why not combine all four of these day hike nutrition tips into one great trail mix? Let's call it the Hiking For Her combo! Don't eat the same old, same old on every day hike. Leave the soggy cheese sandwiches behind. Dare to dream of different Dee-licious snacks! It's time to loop in the overnighters and long trail hikers! 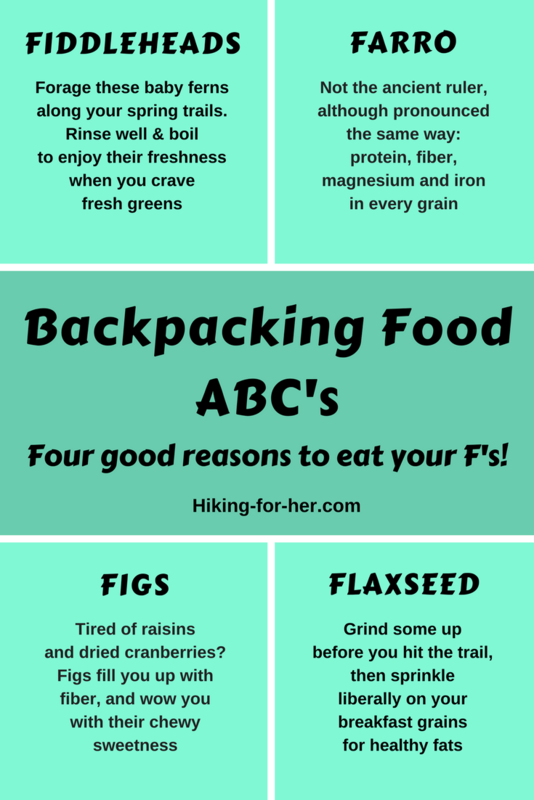 Dayhikers AND backpackers can benefit from including all of these food suggestions in their trail menus. Eating for energy and recovery after a long day on the trail means focusing on great sources of electrolytes and protein. Fiddle around with some new food to jazz up your trail food menus. Munch some granola as you sip a mug of green tea, and keep an eye on the pot of spicy garbanzos you're going to enjoy for dinner. 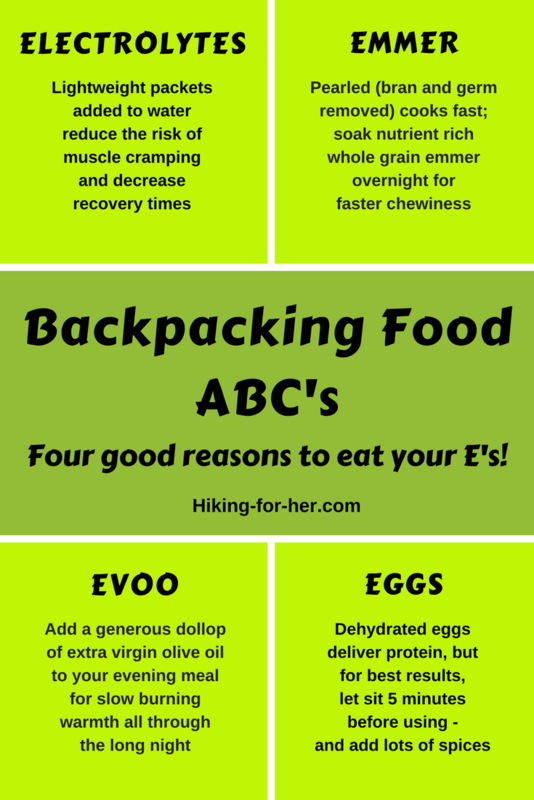 Sweet and spicy, zingy and filling - don't overlook packing these foods on your next hiking trip. Okay, we're having way too much fun here! 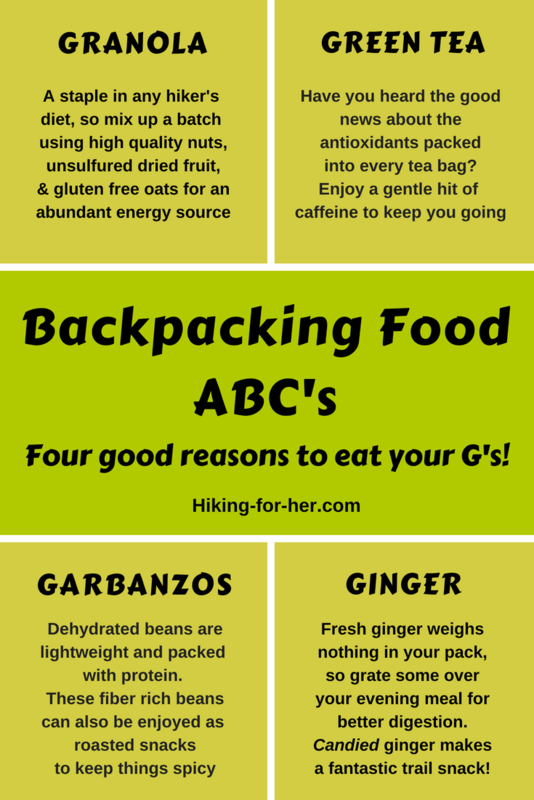 Keep your eye on this page for more ABCs of hiking nutrition tips as we work our way through the alphabet of options for your lunch sack and backpacking menus. Only the nutrition dense yet tasty stuff will make it onto these infographics. And I hope to surprise you with some unusual options that you'd love to try on your next hike. Because eating for excellence on the trail does NOT have to be boring!